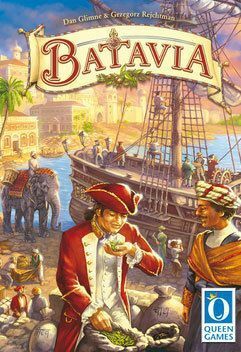 Batavia takes the players into the golden age of the East India companies - England's, Holland's, Sweden's, France's, and Denmark's. And Batavia - now known as Jakarta - wasn't just the main branch of the Dutch East India Company on Java, but the name of their flagship as well. The players, representing merchants, visit the trading posts of the five East India companies all over Asia. Every company's station offers a different good, which will be made available to the merchant who visits the trading post. To get a passage there, you'll need the ship card of the corresponding company. Every turn, these cards will be auctioned off, according to a special method, where there are only winners: the highest bidder gets all the offered cards but divides the money he paid equally among the others. The one who is able to travel to the trading posts with the most lucrative goods will be able to procure the best wares for himself and get the most gold for them at game's end.